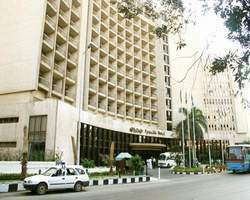 The Siag Pyramids Hotel is merely forty minutes from Cairo International Airport and twenty minutes from Downtown Cairo. Ideal location to stay whether on business or for pleasure, the Siag Pyramids Hotel is the gateway to the greatest historical attractions << The Pyramids >> With its warm traditional welcome and cordial farewell, the Siag Pyramids Hotel is dedicated to provide quality, ensuring an enjoyable stay. The SIAG PYRAMIDS HOTEL offers comfort and repose, with its 300 rooms and suites fully equipped with individually controlled air conditioning, mini fridge, colored T.V. with satellite cable, direct dialing telephone and private bathrooms. From your room's balcony you'll marvel at the magnificent view of the whole plateau of the great Pyramids and by night the Pyramids light show is like a dream. As soon as you step-in, you will feel the Glory and Royalty of a great civilization. An extravagant colossal brass staircase embracing an enormous Murano chandelier in the middle of a huge golden Lobby gives you the sensation of being the King of all Kings. Because you deserve a memorable dining experience we have primed specially for you, sumptuous Buffet in addition to all day and night menu. Select your favorite sophisticated plates from the Buffet and Siag Pyramids Hotel Chef assures fine pleasures to the greatest dining experience you'll have. Come to the gracious service of Kafr Siag; enjoy the fresh breeze carrying around the real tempting Barbecue's smell hanging in the air. Taste a bite of the finest cuts of Veal and Lamb marinated in an authentic fashion style and there will be no doubt when the meat will melt in your mouth, you will surely keep coming back. Unwind your Shisha while savoring your favorite oriental drink, listening to authentic Arabic songs. That's not allæ the magnificent fertile and blossoming greenery surrounding offers you a perfect atmosphere in casual scenery. For those preferring to stay active and fit the SIAG PYRAMIDS HOTEL is the right choice. The blue crystal water of the huge swimming pool tempts you to refresh your body from the burning sun. The Gym equipped with the latest sportive machineries, invites you to stay fit and to exhibit your physical strength. The Sauna is your refuge of peace and a session of massage is your shelter of relaxation. · Banquets up to 500 persons. · Parking up to 100 cars. · Travel agent and Limousine services.